Amy Rice Art: Nice Press for "Paintings in Place"
Nice Press for "Paintings in Place"
Less than two months after the closing of Outsiders and Others, Yuri Arajs is ready to launch his new project, shifting his attention from self-taught first-timers to an established group of painters already enjoying success in today's local scene. The inaugural exhibit at Placement Gallery features the work of Amy Rice, whose memory-steeped depiction of a ponytailed youth calls to mind an embellished dream of childhood. The mood is heightened by the reclaimed and antique-y objects she substitutes for canvases. Arajs' own stark landscapes will hang alongside work by Ben Olson and Alex Alexander. The best art is the kind that shows up anywhere and everywhere, kind of like footprints or dandelions or trash or love or stray hairs or that one really tall and lanky dude who obviously loves him some rock and tight T-shirts. It's art as life. Freelance curator Yuri Arajs know this, and most of the artists and curators in the Twin Cities are catching on to the idea that art can travel, stopping to be viewed in places it normally wouldn't call home: It can appear at the old Theatre Antiques building for a few days, like it did during the recent "Will Work for Food" exhibit. It can hang out in a rented-out warehouse for a week, or a in a lonely condo space that has sat hollow and owner-less since it was rehabbed back when the first leaves fell. On Saturday, Yuri Arajs, co-founder of the now-defunct Outsiders and Others gallery, will hold a premier party for his new Placement Gallery, a traveling and ever-changing art exhibit that can pop up in not-so-familiar places. The first show appears in a giant warehouse on the second floor of 509 First Avenue Northeast. 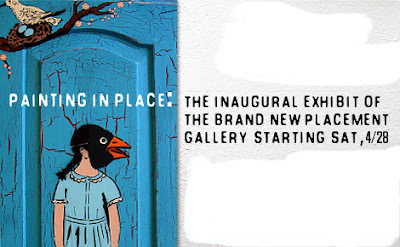 Ironically, or not-so-ironically, titled "Paintings in Place," the show features paintings about a sense of place by Arajs and up-and-coming local artists Amy Rice, Alex Alexander, and Ben Olson. We love Rice's sweet, nostalgic, dream-inspired images the way we love sweet tea and wrap-around porches and baby birds and hatched robin's eggs. She has a knack for creating sentimentality without an ounce of mawkishness.